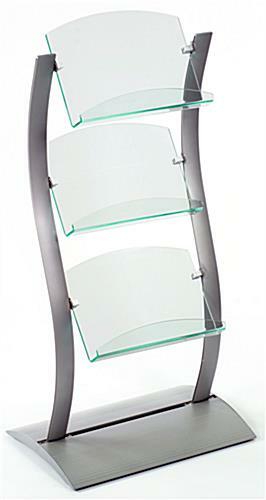 Green-edged acrylic gives an appearance of glass without the high cost. Adjustable clamps let you raise or lower each compartment. 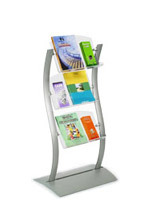 This publication stand will draw customers to your presentations, helping you successfully circulate pamphlets. 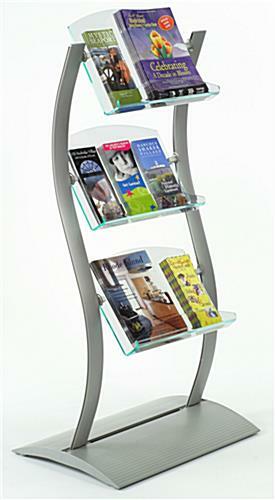 Your literature holder, publication stand features (3) pockets, constructed from green-edged acrylic. 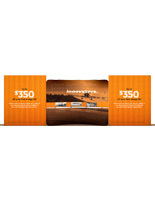 Give an appearance of an expensive, glass display without suffering from the cost! 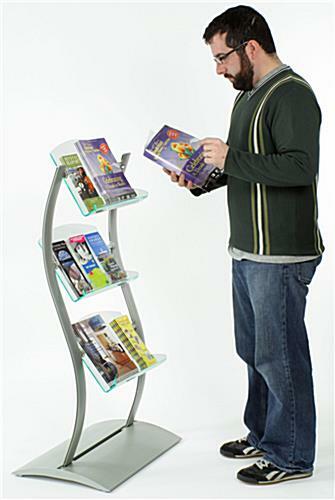 This publication stand, also known as a promotional display, has a unique, wavy design to help draw attention to your pamphlets. 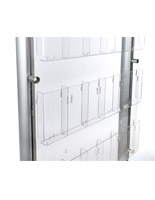 The side supports are made from aluminum and feature a smooth, silver finish for additional draw. The brushed aluminum is also rust-resistant when used indoors! 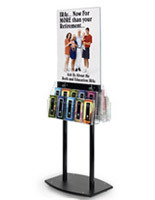 This publication stand is an eye-catching, curved stand to help distribute informational pamphlets or brochures. 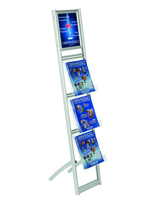 This brochure stand is also an adjustable publication stand! Use the channels along both side supports to alter the height of each pocket. You can also use the brackets to adjust the angle at which each holder sits. 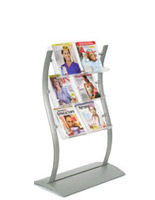 Your indoor fixture, publication stand is a great addition to any office, lobby, store or hotel. 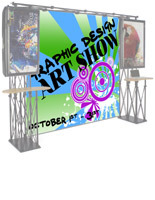 This publication stand, such as our other wave stands, will make patrons even more interested in your display!